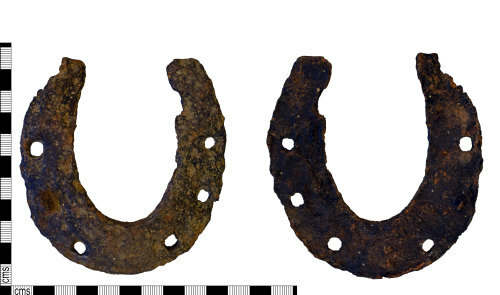 An incomplete iron dove type Horseshoe of Medieval date (AD 1300-1400). The branches are equal in length and incline upwards at the heel. There is no evidence of thickening or calkins at the heel. The shoe has six countersunk square nail holes. One nail has been partially retained. The shoe in plan is flat and is probably a saddle shoe. The object is missing small portions of its heal. Length: 109.81mm, Width: 102.66mm, Thickness: 8.51mm, Weight: 170g. Ref: Ivan G. Sparkes. Old Horseshoes. Page 15.